Strategists said market participants also registered disappointment with provisions of a bailout plan for Spanish banks approved by euro-zone ministers Friday. For now, liability for the package, which is expected to total as much as 100 billion euros ($123 billion), remains with the Spanish government. That “will do nothing to break the ‘vicious circle between banks and sovereigns’ that EU policy makers asserted was ‘imperative to break’ in the statement that followed their June 29” summit meeting, wrote strategists at Capital Economics. Chancellor George Osborne’s deficit-busting plans are struggling to keep up with full-year targets as official figures published today revealed another rise in Government borrowing. Public sector net borrowing, excluding financial interventions, such as bank bailouts, was £14.4 billion in June, up from a revised £13.9 billion the previous year, the Office for National Statistics (ONS) said. So Britain, which is two years into its austerity program, is borrowing more money than ever. It’s not reducing the deficit, it’s exacerbating it. 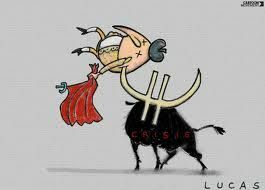 And that’s what you should expect in Spain. The IMF expressed concern about “reinforced negative bank-sovereign linkages” – the increasingly close connection between struggling banks, many sitting on billions of euros of government bonds; and their home states, which in many cases have been forced to offer them aid. This vicious circle “could further weigh on confidence, growth, and public debt trajectories”, the IMF suggested. As Spain’s borrowing costs rose, Germany was able to borrow money at a negative real yield – suggesting investors are effectively willing to pay Berlin for holding on to their cash. In its strongly worded report, the IMF warned that ultra-low bond yields in Germany and other “core” eurozone economies were a sign of malfunctioning financial markets that are depriving other countries of funds. “Investors are withholding funding from member states most in need, moving capital ‘north’ and abroad to perceived safer assets. This has contributed to divergences in liquidity conditions and lending rates within the euro area, adding to already-severe pressures on many bank and sovereign balance sheets and raising questions about the viability of the monetary union itself,” it said. The only country that has benefited from this crisis is Germany and all the talk at the EU Summit to stabilize the euro and end the crisis was useless because German Chancellor Angela Merkel never meant a word she said. And because money talks, this softness – call it the pathos of the plutocrats – has become a major factor in America’s political life. It’s no secret that, at this point, many of America’s richest men – including some former Obama supporters – hate, just hate, President Obama. Why? Well, according to them, it’s because he “demonizes” business – or as Mitt Romney put it earlier this week, he “attacks success.” Listening to them, you’d think that the president was the second coming of Huey Long, preaching class hatred and the need to soak the rich. It’s only been a year since Congressional Republicans, bent on cutting spending, manufactured a financial crisis by threatening not to raise the debt ceiling. Now, apparently thinking the public has forgotten that debacle, they’re furious that Democrats have figured out a way to turn the tables. Senator Patty Murray of Washington, a member of the Democratic leadership, said Monday that her party was prepared to let all the Bush-era tax cuts expire on Jan. 1 if Republicans refuse to raise taxes on the wealthy. The same holds true, she said, for the $1.2 trillion in automatic spending cuts that begin at the same time, which Republicans demanded in the debt crisis but now oppose after realizing that the cuts affect more than social welfare programs. For all the superheated rhetoric of yet another election cycle, it’s as clear as ever that the Republican and Democratic parties in Washington pretty much support the same economic policies. Indeed, any honest perusal of congressional votes proves that the party establishments are roughly the same when it comes to financial deregulation (less of it), job-killing free trade (more of it), bailouts (more of them) and corporate taxes (less of them). Politicians and partisan media outlets deny this obvious reality, of course. But they do so because they have a vested interest in the red-versus-blue “polarization” narrative from which they generate campaign contributions and ratings, respectively. This is why their hysterical attacks on their foes-and their refusal to acknowledge the political duopoly-has such a grating “doth protest too much” quality. It’s also why more Americans are wholly tuning out of politics-we’re less and less interested in gazing at two heads of the same economic monster. That said, if you are still gullible enough to believe the illusion of huge differences on economics, behold the “debate” over taxes that is now roiling the presidential race. These are the dog days of summer and the silly season of presidential campaigns. But can we get real, please? The American economy has moved way beyond outsourcing abroad or even “in-sourcing.” Most big companies headquartered in America don’t send jobs overseas and don’t bring jobs here from abroad. That’s because most are no longer really “American” companies. They’ve become global networks that design, make, buy, and sell things wherever around the world it’s most profitable for them to do so. The people who have been the winners in the massive upward redistribution of income over the last three decades have a happy story that they like to tell themselves and the rest of us: technology did it. The reason why this is a happy story is that technology develops to a large extent beyond our control. None of us can decide exactly what direction innovations in computers, automation, or medicine will take. Scientists and engineers in these areas follow their leads and innovate where they can. If the outcome of these innovations is an economy that is more unequal, that may be unfortunate, but you can’t get mad at the technology. This is why the beneficiaries of growing inequality are always happy to tell us that the problem is technology. It’s turning into a hot climate summer in two ways, only one of which you can measure with a thermometer. Amidst the deepening drought, the summer’s fourth heat wave, and the continued western fires, there’s something else breaking out: a siege of citizen uprisings at key points around the country all designed to keep coal in the hole, oil in the soil, gas… underground. Ever since the mass arrests protesting the Keystone pipeline last summer (the largest civil disobedience action in the U.S. in 30 years) there’s been renewed interest in confronting the fossil fuel industry and its political enablers. Some have been following this path for years, of course — late next week, beginning July 25, opponents of mountain-top removal coal-mining will resume their long-standing (and increasingly successful fight), with a week-long Mountain Mobilization that will likely include civil disobedience. Maria, you are not entitled to creating your own facts. On this day in 1881, Sitting Bull surrenders. Five years after General George A. Custer’s infamous defeat at the Battle of Little Bighorn, Hunkpapa Teton Sioux leader Sitting Bull surrenders to the U.S. Army, which promises amnesty for him and his followers. Sitting Bull had been a major leader in the 1876 Sioux uprising that resulted in the death of Custer and 264 of his men at Little Bighorn. Pursued by the U.S. Army after the Indian victory, he escaped to Canada with his followers. 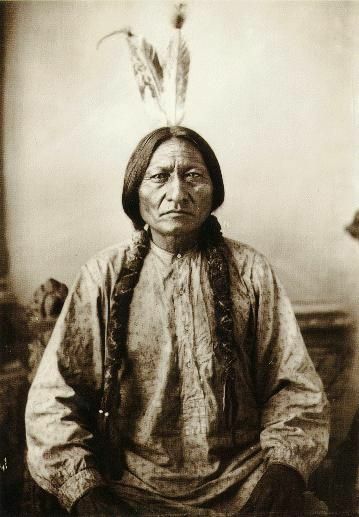 Hunger and cold eventually forced Sitting Bull, his family, and nearly 200 other Sioux in his band to return to the United States and surrender on July 19, 1881. Sitting Bull had his young son Crow Foot surrender his rifle to the commanding officer of Fort Buford. He told the soldiers that he wished to regard them and the white race as friends. Two weeks later, Sitting Bull and his band were transferred to Fort Yates, the military post located adjacent to the Standing Rock Agency. Arriving with 185 people, Sitting Bull and his band were kept separate from the other Hunkpapa gathered at the agency. Army officials were concerned that the famed chief would stir up trouble among the recently surrendered northern bands. On August 26, 1881, he was visited by census taker William T. Selwyn who counted twelve people in the Hunkpapa leader’s immediate family. Forty-one families, totaling 195 people, were recorded in Sitting Bull’s band. The military decided to transfer him and his band to Fort Randall, to be held as prisoners of war. Loaded onto a steamboat, Sitting Bull’s band, now totaling 172 people, were sent down the Missouri River to Fort Randall. There they spent the next 20 months. They were allowed to return to the Standing Rock Agency in May 1883. Hopes that Cadel was having a bad recovery from the rest day faded when I heard him refer to seeing how his “health” recovers. Word was he had a “parasite” he was diagnosed with two hours before the race on Wednesday’s stage. Oh, joy! No wonder he lost big time ~ the wonder is he didn’t drop out of the top ten altogether. The problem with the Yellow Jersey competition is that the race was designed for a four way show-down between Evans, Wiggins, Andy Schleck, and Alberto Contador, and then Contador was found guilty of doping, Schleck was knocked out by injury, and it seems like Global Warming conspired to do Evans in ~ he’s not got a reputation for coping well with the very hot conditions, and this was one hot run through the Alps they had in week two. If he was fighting at his limit just to hang on, catching some bug on the rest day is no surprise. What made today’s stage was the King of the Mountains competition ~ Voeckler vs Kessiakoff was a fine fight. As far as the Mountain stages, its not how long they are, its how long the top contenders put each other under pressure. If you add one more HC to the front of yesterday’s stage ~ the Queen State ~ it wouldn’t add any more racing. Indeed, by wearing down teams other than Sky, it could easily have led to less. Without Schleck and Contador in the peleton, then the two remaining serious climbing contenders, Evans and Nibali, are more pace-climbing riders than attacking climbers. Some commentators on PodiumCafe question the design of the course for some of the stages. But I can see places on each of the stage where earlier attacks could have been made ~ had someone had the GC contender and the supporting team to launch the attack and then back it up. In the end, the riders make the race, and the two best GC riders in the race this year were riding on the same team. Move Froome to BMC or Liquigas, and run it again, and the same course would see fireworks, and we would have Froome going into the final time trial leading by a minute or more, but Wiggins making up time in the time trial, just as Evans did rising as second last in the time trial last year, except with an excellent time trialer riding last defending his yellow jersey, instead of Andy Schleck. Riders that did not appear in Stage 17 were Vladimir Gusev and Grega Bole. Frank Schleck withdrew after testing positive for the diuretic Xipamide. Today’s stage is labeled ‘Plains’ and has a category 3 and three category 4 climbs. Points will be awarded in Hill Climbing but probably not enough to make any difference. The Award point is in the middle of a category 4 climb 2.5 km from the top, so that could be interesting. Tomorrow is the 3rd Individual Time Trial, the final day anything much will change (by custom) except amongst the Sprinters. Sunday we finish Le Tour on the Champs-Élysées. Coverage is customarily on Vs. (NBC Sports) starting at 7:30 am with repeats at noon, 2:30 pm, 8 pm, and midnight. There will be some streaming evidently, but not all of it is free.